and Thel Melton (Lari Cowgill not pictured). 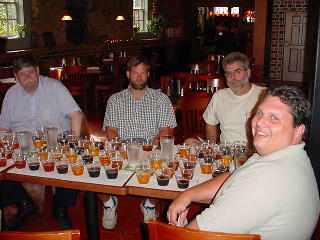 Owen Ogletree (director of Brewtopia Events LLC) gathered together some of his fellow beer enthusiasts on June 18, 2003 at Athens' Steam Company Pub to sample and comment on several mixed styles of ales and lagers. This beer sampling was done as a blind tasting where no one was aware of the brands that were being served. Beers were informally commented upon and ranked according to Beer Judge Certification Program (BJCP) style guidelines. First, second, third places, and honorable mention were awarded to the beers we felt represented their individual styles in extraordinary fashion. Drop Owen an email to share your comments and opinions. 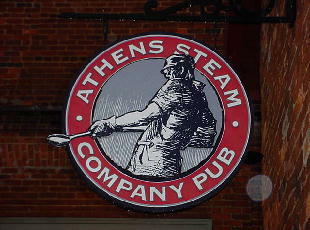 Athens Steam Company Pub was gracious enough to host our evaluation of these beers. Visit the pub soon for a fine selection of beer and delicious food. Aroma: Roasty, malty, coffee-like with low hop aroma. Smells like coffee with cream and a hint of chocolate. Nice. Appearance: Dark black in color. Hints of ruby in the light. Flavor: Coffee-like, dry, roast malt tones, good bitterness, fruity, creamy (but with a dry finish). This is a luxurious Dry Stout that is right on style. This beer was almost unanimous for first place. Good job. Aroma: Malt aroma with fruit and plums. Very elegant, yet mild aroma. Appearance: Dark gold and clear with light carbonation. Flavor: Plums, slight cherry, fruity with a good balance of malt and English hops. Light in body -- an appealing session ale. Makes you want to have another. Aroma: Fruit, rich malt, spicy/woody hops. The aroma is nice, but mild. Appearance: Copper in color with an attractive, clear appearance. Good carbonation for style. Flavor: Big malt and hop character for style. Well balanced. Hints of caramel, toffee, and fruit. This is a complex ale with a good depth of hops and malt -- delicious. Aroma: Banana, clove, mild spice. Appearance: Golden, glowing, cloudy -- excellent and on-style. Flavor: Mild flavors of wheat, clove, and citrus. Very refreshing and pleasant, but could be a bit more complex, rich, and three dimensional. Aroma: Spicy hop aroma that is also very floral. Malt is present and well-balanced with Czech hops. Appearance: Clear and golden in color. Flavor: Crisp, malty, low sulfur undertones. Clean (not fruity) with an elegant hop flavor and bitterness. Very good for style. Aroma: Fruity, plummy, woody -- with hints of caramel. Appearance: Light brown in color with dark red highlights. Clear and attractive. Flavor: Malt, alcohol, fruit, toffee, caramel. This ale has a big malt component. This is a rich ale for style. Very fruity as it warms. Hops are in the background. Aroma: Phenolic, plastic-like, spicy. Banana undertones are present. Overall aroma is very light. Flavor: Mild and a bit watery. There are butter and vegetal notes. Flavor is also very mild. Should be refreshing with more wheat character. Aroma: Smells like buttered nuts. Has a nice, mild aroma. Appearance: Dark amber and clear. Very pleasant appearance with nice head retention. Flavor: Moderate butter notes are not good for style. Tastes like pecan ice cream. There are undertones of hazelnut, roast, and moderate sweetness in the finish. This is a very appealing beer, but has some character that is not appropriate for the style. Aroma: Malty, hoppy, and citrusy with slight hints of phenol. Appearance: Clear, medium gold in color, beautiful. Flavor: Slight malt with nice hops. Good hop flavor and aroma. Is there a tiny band-aid (phenolic) flavor? Otherwise, this is a good version of a Best Bitter. Aroma: Light nuts. Slight fruit. Malty. Appearance: Clear with a dark amber color. There is good carbonation and a stable head. Flavor: Sweet and malty with some honey notes. There are also hints of caramel and fruit (esters). This beer is somewhat two-dimensional with a sweetness that dominates the profile. Smooth and mild, but needs more of a dry finish. Aroma: Apple-like, fruit, resiny American hops. Appearance: White foam with a clear, light golden color on the pale end of the style. Flavor: Dry aftertaste that needs a touch more malt to balance the hops. There is a bit of astringency in the aftertaste. Piney/citrusy American hops make this beer very dry. More malt would be helpful. Aroma: Light aroma with a mild fruity character. Should have more roasty aromas. Appearance: Jet black in color -- attractive. Has a creamy, brown head. Flavor: Some tart/sour hints (ok for style). Very dry with a clean, abrupt finish. Needs more coffee/roasted malt flavor. Does not taste like rich, dark malt. Flavors are mild, but pleasant. Aroma: Malt and NW American hops. Very mild aroma with little or no chili notes. Appearance: Golden and clear with a very white foam. Flavor: Malt and NW hops (citrus, pine resin) dominate flavor. There is a hint of smoke and a black pepper-like tingle in the finish. There is only a hint of chili and smoke. The chipotle character is very much in the background.